Is it just me or are guys unbelievably hard to buy for? Will always wants really expensive things or goes out and buys what he wants/needs as soon as he wants/needs it. I feel like my mom always had a really good approach to stocking stuffers when I was growing up, and it actually works really well for men in particular. The concept is simple. You fill the stocking with a few things he wants, a few things he needs and fill the rest of the space with something to eat. I’ve got some suggestions for all three categories + a bonus category. 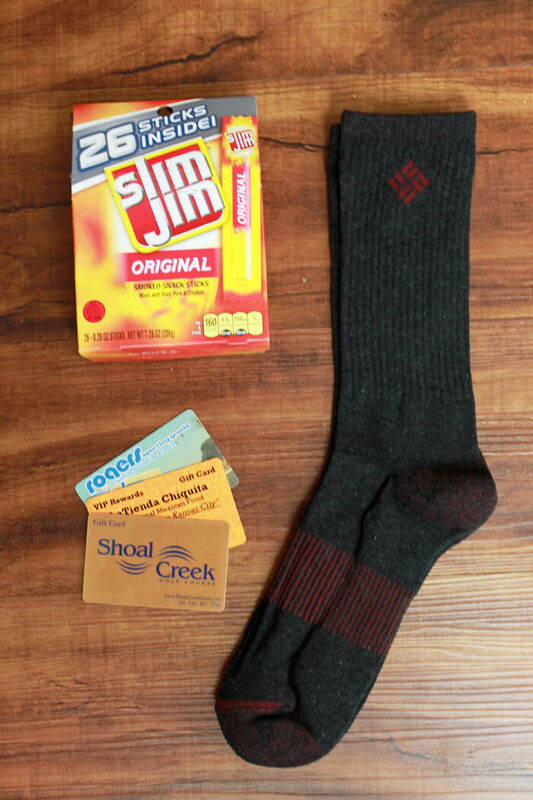 Something he wants: Gift cards are the perfect size for stocking stuffing. Get a few gift cards to his favorite restaurant, his favorite clothing store and maybe one to a sporting goods or home improvement store, $10-15 on each is plenty if you’re buying more than one. Also buy a couple small things for his favorite hobby. Golf balls and tees would be perfect for a guy who enjoys golf, or a video game or two for a gamer. Something he needs: These might not be as fun to receive, but they’re necessary and you know they’ll be used. Socks, razors (why are razors so expensive?? 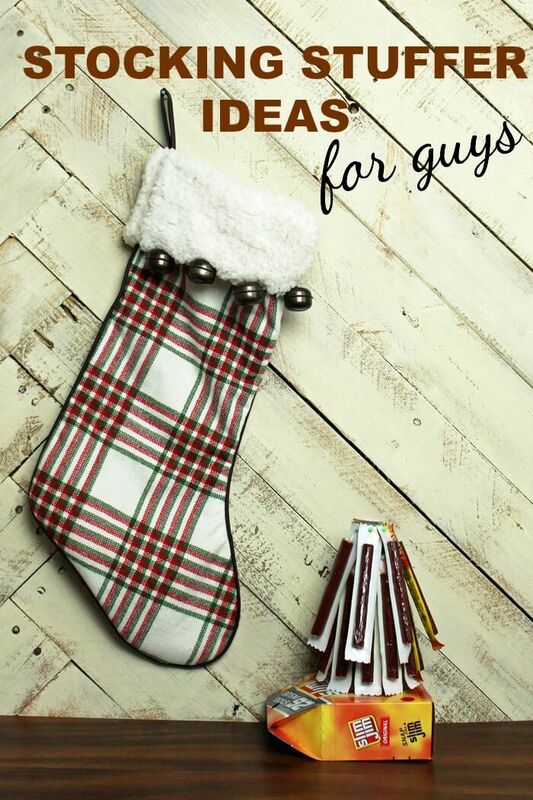 ), you can even buy his favorite shampoo and body wash. All of these things fit perfectly in a stocking! Something to eat: This one is so easy. Please tell me if you’ve ever met a guy who doesn’t like beef jerky, because I haven’t. 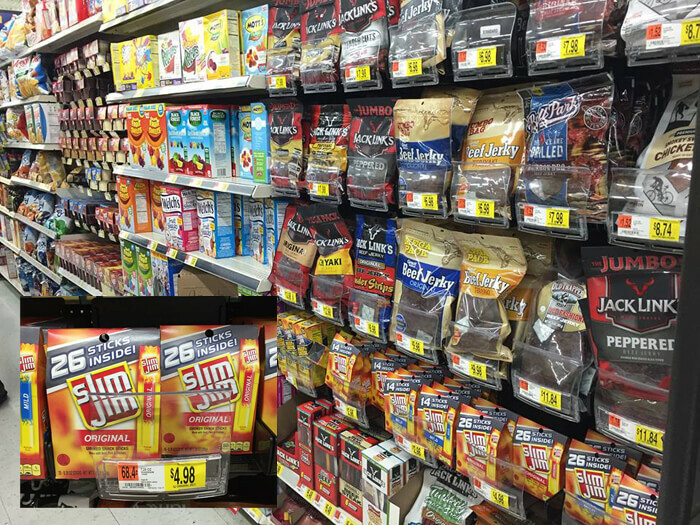 These Slim Jim Gable 26 packs from Walmart are the perfect size to stuff the whole box in the stocking, or you can fill in the space by dumping them in. There’s actually alot of different ways to give these. 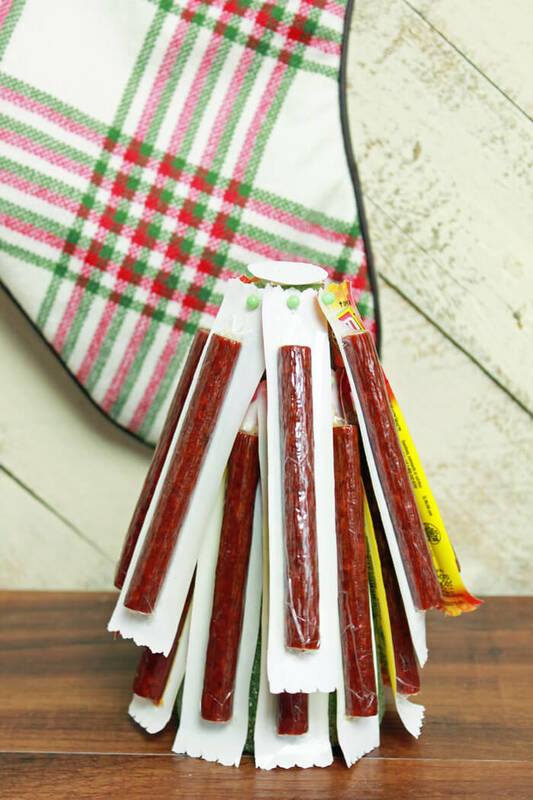 Hang them on the tree for a fun Christmas morning surprise, or create a special Slim Jim tree if you want to get crafty – just don’t expect it to last long because he’s sure to get into them immediately. Around Christmas time I really want to be crafty, but I don’t want to spend all my time working on crafts. Quick and easy is my Christmas craft jam. 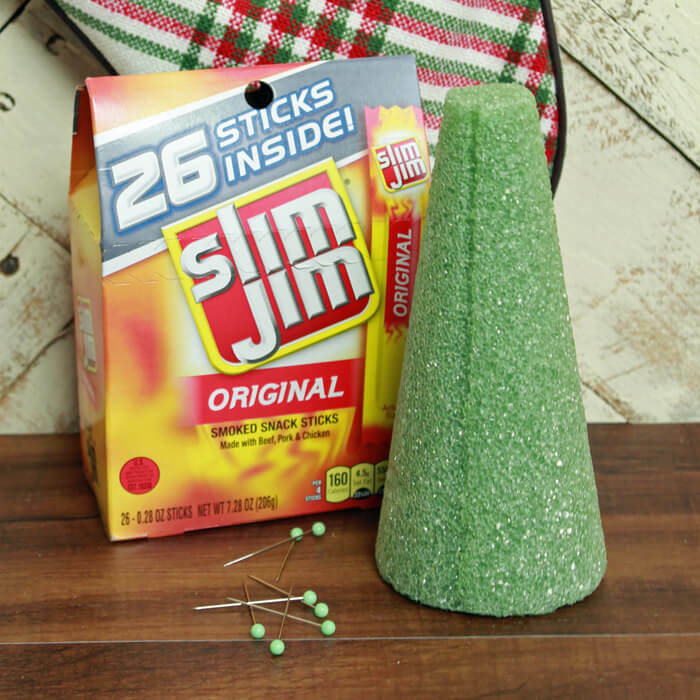 This Slim Jim Christmas tree is seriously the easiest DIY ever and only requires 3 things – Slim Jims, a styrofoam cone, and pins. Step one: Pin layers of Slim Jims around your cone starting from the bottom. Step two: Cut a circle the size of the top of the cone out of white paper and tape it on so it looks finished. Ta-da. Seriously, that’s all there is. And one of the great things about your favorite guy is that he isn’t likely to notice the imperfections in your craft because let’s be honest, you’re doing this craft for you, not him! He just cares about the Slim Jims! These cones come in all sizes, you can even buy the biggest size and serve up your jerky at a holiday party! How fun would that be? Find more ideas to #SlimJimYourHoliday here. What’s your favorite thing to give the guys in your life? My mom’s a genius, huh? It definitely simplifies the process! Are you serious? Why would you leave the worst tasting product on the market for someone you love? Or are you trying to give them the hint that you want them dead? Try some great snack food like trail mix, mixed nus, check out the bulk bins at one of your local markets. Want to really let them know you love them bake or make them something. Some ideas are snickerdoodles, chocolate cookies, etc. How about a 30 mini messages of love in a jar. They pull one a day for a month. Special message every day. I made my husband 4 “round-to-its” one year. It only took a few minuets & we still laugh about it.